The Birdman: based on early Maori rock drawings in the South Island. Based on the U.S. ‘Jenny’ stamp, created in 1918. 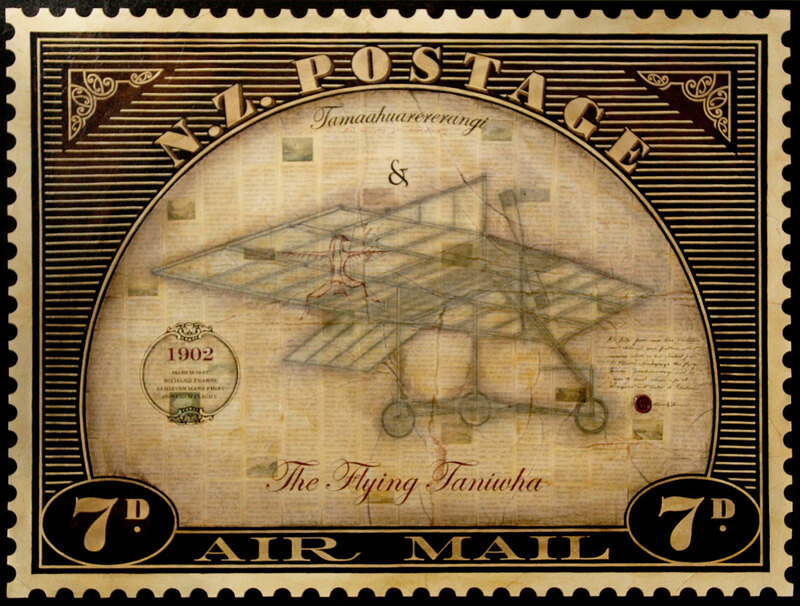 The Jenny (name of the plane) stamps were the first airmail stamps created. Tamaahua saw a large creature standing in shallow water along the beach. As he was to plunge his weapon into it, it awoke and seized him. He was then flown to Hawaiki where many Taniwha decided his fate. They concluded that Te Manunui a Ruakapanga was at fault as he was a Taniwha of the air and had no right to be lying in the water. Fortunate Tamaahua was flown home on a different Taniwha of which he managed to pluck a few wing feathers from, that were called Rauamoa which gave him his unique powers. Richard Pearse from Waitohi, near Timaru achieved the first powered flight on 31st March 1902, over a year before the Wright Brothers! Pearse had managed to fly about a kilometer. His success was never acknowledged fully was because he didn’t really think it was such a big deal.